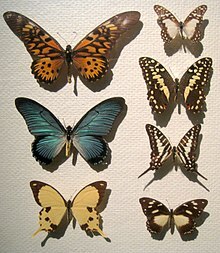 Swallowtail butterflees are large, colourfu Butterflees in the faimily Papilionidae, an include ower 550 species. ↑ Häuser, Christoph L.; de Jong, Rienk; Lamas, Gerardo; Robbins, Robert K.; Smith, Campbell; Vane-Wright, Richard I. (28 July 2005). "Papilionidae – revised GloBIS/GART species checklist (2nd draft)". Retrieved 8 November 2010. This page wis last eeditit on 8 Apryle 2017, at 01:27.